This months maker feature is Jessica VanderVere from Bee Joyful Shop, who’s business focuses on alternatives to single use plastics. Jessica is a Michigan girl - born and raised in Allegan, Michigan and still living here with her five children today! Growing up, she and her family lived completely off the grid (AKA no electricity and no running water) which ultimately helped her learn to be incredibly resourceful. This quality spirit still shines through in her life and business to this day. Two years later, Bee Joyful Shop is proud to be plastic free and helping others’ to achieve the same. Her most popular item is the three-pack of bee patterned material. Jessica joined us when we opened our City Market location and has been an amazing addition to all the unique handmade products we carry in store! You can find her items at the shop, or by clicking the link below. This month we get to introduce you to Andrea Archambault who is the owner and graphic designer behind Arch. Andrea is a Michigan-west-coaster; growing up in the Muskegon area, attending college at Ferris State University, and now residing in Holland/Zeeland area. She took her first graphic design class in high school, fell in love, and has been working in the field personally and professionally ever since. Initially, friends and family suggested that she sell her art and services online, but Andrea didn’t actually take the plunge until she created a Pregnancy Countdown Chain to announce her own pregnancy to her parents. It was a hit and it led her to opening her very own shop on Etsy! The name of her business has been a work in progress throughout the years. Her online presence was initially in blog form, and over the years she’s changed the name a few times, ultimately resulting in the short and sweet “Arch” that we know today (based on her own last name). Andrea is a full-time graphic designer by day, but says, “my shop gives me the kind of freedom I don’t necessarily have in the corporate world or even when working with many of my freelance clients.” She absolutely loves her side-job! One of her favorite scenarios is when she gets a custom request and the client gives her total freedom to create something unique for them. You can find Arch in our store, or online by clicking the link below. BONUS: Andrea is offering you a discount this month only when you order from her website. Enter the code HALFMILE25 for 25% off your order! It's May and we get to introduce to you yet another amazing maker that sells handmade goods with our shop. This month we are talking about Shannon from All That 'N A Ball of Yarn. She is a Michigan based maker that works with, you guessed it, YARN! We first gained interest in Shannon's products at a craft show we met her at when we were looking for kitchen and gardening goods for our booth inside City Market. She is originally from Sylvania, Ohio but lives in Brighton, Michigan now with her hubby and daughter. She learned to sew and crochet at a young age and fondly recalls memories of time spent on these activities with her grandmother who taught her these skills. She said she's always had a passion for design in many forms and crochet is just one of the many ways she gets to explore that passion. Shannon's husband came up with the name of her business, All That 'N A Ball of Yarn , because it doesn't restrict what she can create. Yes, the focus is items created using yarn, but the name is vague enough that she can let her creative side run wild! She has always wanted to own her own business and started dabbling in this handmade gig in 2014. When her daughter was born in 2015, she decided to stay home with her and really started working hard on the business and began doing shows and markets with the help of her mother. Coming up with new designs to add to her inventory is Shannon's favorite part in the process. She also mentions her appreciation for the research and development that goes into each new item, "they may not always work, but trial and error is a huge part of the process as well." Among all that she makes, reusable Swiffer covers and children's hats are the most popular items! You can shop All That 'N A Ball of Yarn products by visiting us at either location, or clicking the link below. This month we get to introduce you to Michigan maker Lacy Mrock from MRockStar Designs! 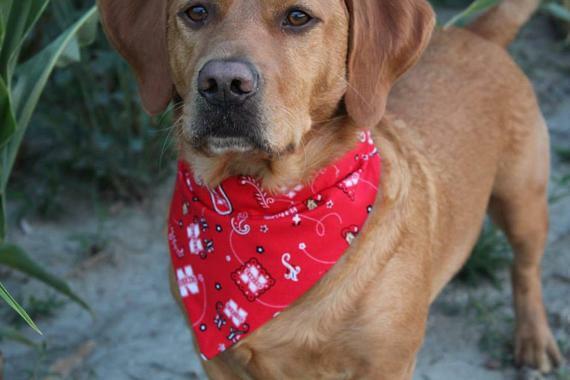 Lacy is mitten-born-and-raised and still lives in our great state to this day. She and her husband are both craft beer drinkers and her business is built around BEER - how awesome is that?! Lacy upcycles bottle caps to make a variety of products including earrings, keychains, magnetic bottle openers, and even board games! After being laid off from work several years ago, she started making jewelry as a hobby. She made a pair of earrings on Christmas that got her lots of compliments anywhere she went. The craft beer industry was beginning to explode around this time too and from there she took initiative to expand her offering to everything we mentioned before. The rest, as they say a lot in the handmade world, is history! She knew she could make a business based around repurposing these bottle caps. Lacy and a friend came up with the name for her business as a play-on-words using her last name and she was up and running in no time. When we asked Lacy what her favorite part of the process was she said, "drinking the beer of course!" Probably a silly question on our part! 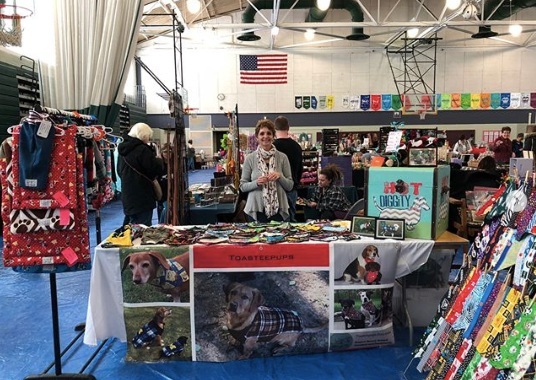 Lacy sells her goods online, in stores, and at many shows throughout the spring and summer so as you can imagine this business keeps her pretty busy. You can get your own MRockStar Designs pieces by visiting either of our locations, or clicking the link below! This month we are excited to introduce you to Robin Colion from Robin's Lullaby Boutique out of Houston, Texas! Robin makes handcrafted custom baby essentials. As you may know, summers in Texas are HOT, and on those days Robin would spend time in her grandmothers craft room. She remembers sitting next to her grandmother at the sewing machine and learning a ton! Robin recalls the first thing she ever sewed was a quilt for one of her baby dolls (we'd love to see a photo of that)! so this is the perfect combination for me," she says. The name of her shop, Robin's Lullaby Boutique, came from the songs Robin would sing to her girls as babies while she rocked them to sleep. Robin's favorite part of her handmade biz is working closely with her customers to create one of a kind and meaningful pieces, "I love hearing from people about how their order is for their dear family member or friend who is having a baby. It makes me proud to know something I physically made with my own two hands is going to be cherished by a mother for the rest of her life." Robin's beautiful pieces have been a wonderful addition to our shop, and she's even made us some Michigan themed bodysuits for your little ones as well. You can shop Robin's Lullaby Boutique by visiting us on Water Street, or clicking the button below! Hey 2018! After a month off we are so excited to re-start introducing to you to our makers each and every month. We are kicking things off with Ashley Aranda from Papyrusaurus (currently based in Long Island New York)! Ashley is originally from Pennsylvania and has also spent some time in Savannah, Georgia while attending The Savannah College of Art & Design. She's obviously always been the creative type, but adulting and being a mommy to two boys took up a good chunk of her time until one day she sat down and started "tinkering with some paper crafts." What she came up with that day was a beautiful ornament made from book pages. Ashley really liked it and decided to make more, friends encouraged her to open an Etsy shop, she got an order from a large gallery the second year in, started doing shows, and the rest as they say is history. Ashley says, "I kind of really stumbled into it." We hear from a lot of makers that they start in this unknowing kind of way and love hearing the success stories that come from picking up and doing something that they love and are passionate about! The name of her business came in a random way as well. Ashley and her boy were watching Dinosaur Train (specifically the Dinosaur Alphabet episode), with paper in her hands the name popped into her head as she was signing along. Some of her favorite parts of having this business are shopping used book stores and flea markets for supplies, and brainstorming new ideas for the holidays! Papyrusaurus is Ashley's "full-time-blood-sweat-and-tears-gig" and we're so happy she does it + sells her amazingly handcrafted items in our shop. They are truly one of a kind! You can shop Papyrusaurus items by stopping in to our shop, visiting her online by clicking below, or following her on social media to find out what show she'll be at next (she does A LOT). This month we are very pleased to introduce you to Karlee Miller, the Michigan based maker behind Maiden Hands. Karlee was born/raised and still resides in our great state of Michigan. She grew up with a mom and grandmother that crocheted beautiful afghans and it was a skill that Karlee had always wanted to learn. About five years ago, while on maternity leave, Karlee got her mom to show her the in's and out's of crocheting and it finally stuck, she says "I just can't seem to put down my crochet hook!" About a year after learning this new craft friends and family members started asking about hats and scarves and she decided to start selling them at that point. A friend came up with the name for her business. Karlee explains, "if you haven’t caught on its “made in hands” (aka Michigan) with a womanly twist." (Ahhhh, we get it now)! Her favorite parts in the process are the very beginning stages when a customer sends her a request, the end when she gets to see and hold the final product, and also being able to see a customers response to what she has made special just for them! Karlee has a Bachelor's Degree in Graphic Design which has come in handy in her small business. She works full-time and Maiden Hands is very much a creative outlet for her at the current time. In addition to crochet items, she also gets several requests for custom wooden signs. Maiden Hands joined the Half Mile Handmade family in the summer of 2017 when we opened our booth inside City Market and we have been so happy to stock her adorable cup cozy's! You can shop Maiden Hands products by stopping in to see us or contacting Karlee directly through her Facebook or Instagram. This month we get to introduce you to Cheyenne Taylor the owner and maker at The Crooked Dollhouse! Chey is Michigan born and raised and currently lives in Vassar. Like many of our makers, she has always had an interest and hand in being crafty and also enjoys photography. She says, "Creating and capturing beautiful things is uber relaxing for me, so I’m incredibly lucky to have a job that allows me to do both!" In 2014 Chey was given a box full of broken family jewelry that she decided she would fix. She mended chains, added charms, and put some life back into the pieces that had been unused for so long. From there jewelry making just stuck and in 2015 she decided to make a business of creating her own unique designs created start to finish by hand! The name of her business, The Crooked Dollhouse, is unique just like each piece she makes and the people that wear it. Jewelry making is her full time job and there is no part in the process that Chey does not completely adore. She even says that packaging up orders brings her a lot of joy, "I always get excited when shipping an order, because it means I get to package everything up super cute." We have been lucky to stock The Crooked Dollhouse pieces since we opened in 2016 and love that her inventory is always changing and fresh. You can shop her jewelry buy stopping in to see us on Water Street or by clicking the link below! Introducing our featured maker for the month of September, Heather, from Heather Made Designs! 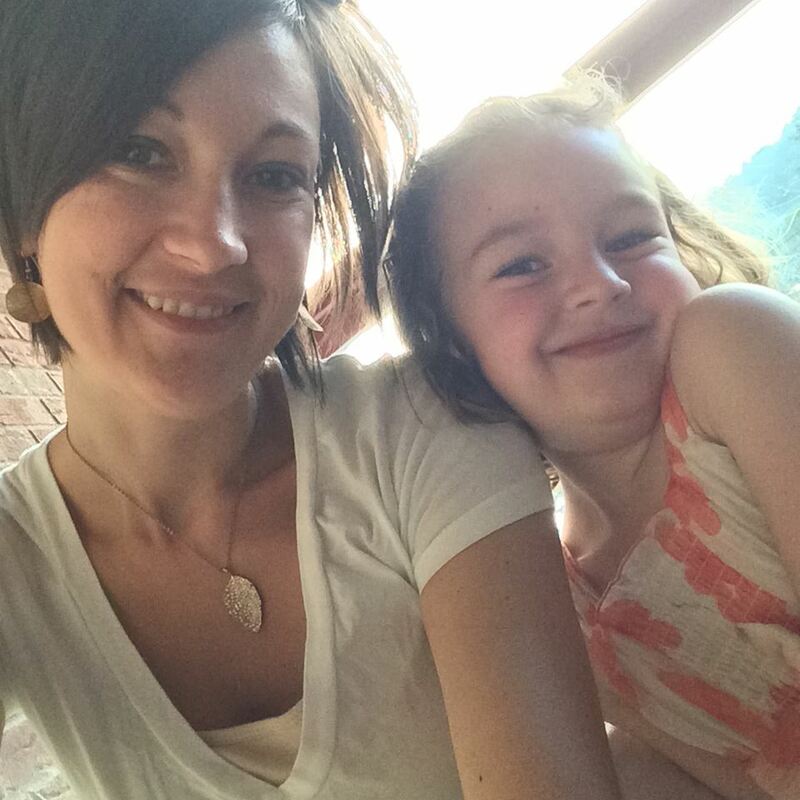 Heather is Grand Rapids, Michigan born and raised and has had an affinity for arts and crafts from a very young age. Her mother always encouraged Heather and her sister to create and taught them many crafty skills such as sewing, crocheting, knitting, and even drawing lessons! 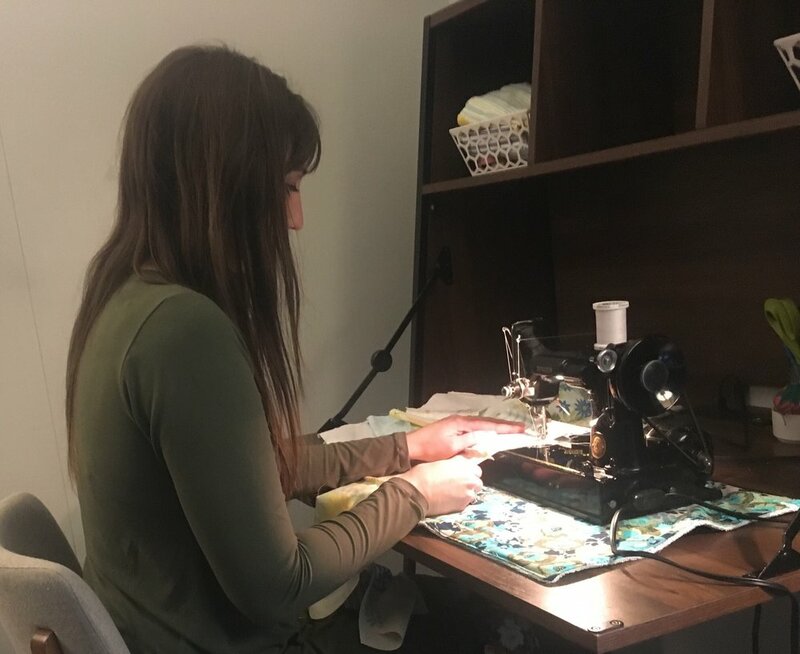 When Heather got married, her mom bought her a Featherweight Sewing Machine as a wedding gift so she could continue to make things for her family. The skills she acquired as a child and gift of the sewing machine were the "building blocks" for Heather Made Designs. Heather was creating more things than her family and friends needed and the business side of things really got going after she signed up for a couple craft shows and loved them! Going to these events has even allowed her to meet other makers, many of which are close friends now. She says buying fabric is her favorite part in the creative process (we know that feeling all too well, Heather!) because she is able to choose colorful patterns to use together in her work. Heather Made Designs is a hobby and part-time endeavor that she has been doing for 12 years - double digits! When she's not busy sewing she spends time with her hubby and three kiddos! You can check out Heather's products at one of her upcoming shows (9/16: Eastern & Alger Pop-Up Market or 9/22-9/23: Farm Girl Flea) by stopping into our shop on Water Street, or by clicking the link below. We have loved having Heather's baby items in our shop - they're just adorable! August Meet the Maker Featuring Boonie Patch Co.
Today, we are excited to introduce you to Boonie Patch Co., our first 'maker-duo' since starting this series on our blog! Boonie Patch Co. started in March of 2016 out of Toledo, OH and is owned by Greg Patrisso and Natalie Deeb. The two of them were always doodling in notebooks and sketchbooks in college and came up with the idea that they wanted to start a creative business of some sort with these drawings. In the beginning they didn't know it would end up being amazing pins and patches but after weeks of talking and research they decided this would be the best route for them to pursue (and we're SO GLAD they did)! After deciding to make patches they had two ready to sell within the first month! A simple, but effective brainstorming session is the story behind their company name. (Natalie and Greg said they get asked this question a lot). They made a list of potential business names, and Boonie is the one that stuck. Natalie says, "we cannot even imagine a different name being attached to our products and our brand!" As almost all of our makers have said, creating graphics in Adobe Illustrator is their favorite part in the creative process. They love making new designs come to life and posting sneak peeks for customers. Another fun aspect they have been pursuing more is collaborating with other local Toledo artists on projects. Both Greg and Natalie are still in school, working part-time, and consider Boonie Patch Co. a full-time endeavor on top of that. As most creative entrepreneurs are aware, you spend a lot more time than you'd think building your business and brand, it's pretty easy to work your way up to 40+ hours a week on top of everything else you have going on! Kudos, by the way you two! We have loved having Boonie Patch Co.'s trendy products in our shop since the beginning of this year and we look forward to seeing what designs they'll come up with for us next! You can find their products by visiting our shop on Water Street, clicking the link below, or by stopping to say hi at one of their many upcoming shows (they're seriously EVERYWHERE)! Today we are thrilled to tell you all about our friend Nancy Lacke from Adore Jules out of Columbus, Ohio! Nancy was born and raised in Chicago, Illinois and growing up was naturally surrounded by "art, museums, theatre, fashion, etc. and her family exposed her to ALL OF IT." (She says, 'thanks mom and dad')! Nancy says her jewelry obsession began with a special gift from her dad at the age of 5. It was a sterling ring with an aqua crystal, and YES, she still has it! Being creative has played a big role in Nancy's life from youth to young mom to the present. As her children got older, she started taking drawing classes and later jewelry making classes. She started out making pieces for family and friends. One of her nieces along the way suggested opening an Etsy shop, which Nancy did, and that's how her small business started. Nancy credits the name of her business to divine intervention. She explains, "I can remember sitting at my desk at work brainstorming ideas for my business. I thought about the adore chapel at my church and that word, "adore" - I adore jewels, but didn't want to spell jewels in the usual way so I changed it to 'jules.'" Nancy graduated from the University of Wisconsin-Whitewhater with a degree in Education, and taught for a period of time. 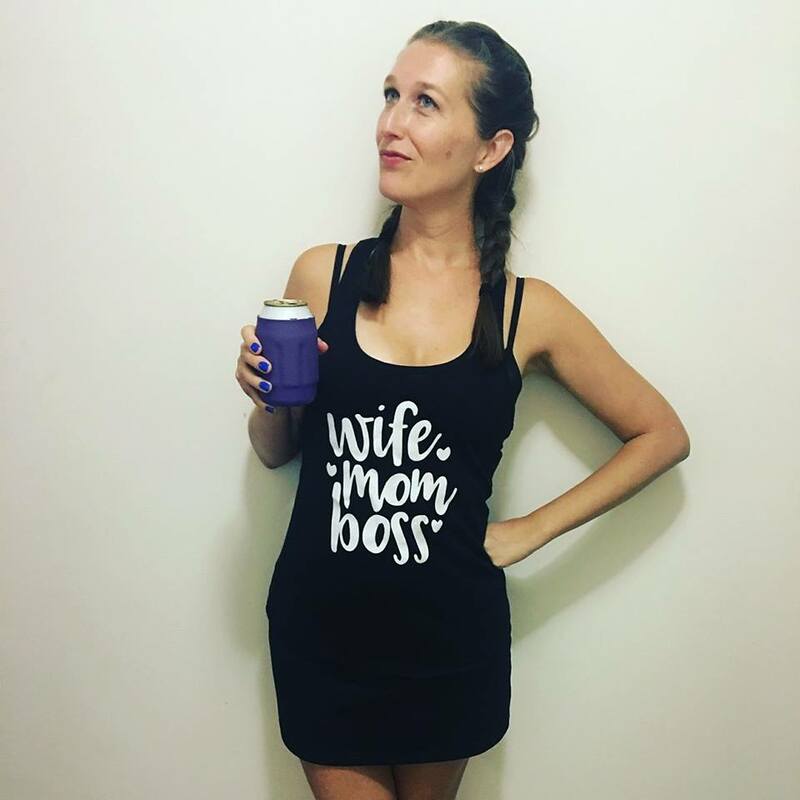 Today she has a full-time job, but Adore Jules is her passion and over time has evolved from a hobby to a full blown business. As most of our makers have told us, the creation process is her absolute favorite! She incorporates everything into her unique jewelry pieces from gemstones, to vintage items, hand stamping, leather, and much more. Adore Jules has been part of our shop since day one and Nancy has even made the 5 hour trek from Columbus, Ohio to see our shop in person. She also donates a portion of all of her sales to Dress for Success Columbus, and is offering all of you 15% off her site all month long using code "halfmile15"! You can find Adore Jules at our shop, online by clicking the button below, at Gervasi Vinyard Fine Arts & Crafts Show (July 23rd), or at the Made Local Marketplace Fall Show (October 7th). Today we have the pleasure of introducing you to Heather Spooner from Spoonfeather Designs out of Detroit, Michigan! Heather is a hand-letterer that puts her penmanship on everything from paper to sun hats. Most of her childhood was spent practicing her handwriting. She explains that she, "was always the kid who got asked to make poster for school fundraisers, draw on other students paper bag book covers and design group project." As she grew up friends still continued to ask her to letter fun projects for them, and it seemed like a good business idea to run with! When we asked Heather to tell us how she named her business she said, "when you have the last name Spooner, you obviously have to use it in your business name! Most of my childhood, people called me Heather Feather, so I thought combining words to play off of my name would be a great way to infuse my personality into my business and help my customers remember my name." She says her favorite part of her creative process is working with clients to create timeless decor pieces. Spoonfeather Designs is Heather's full time job, and she is constantly working on adding "relevant and interesting products" to her business, including hand lettering classes that just launched this year! Heather has been with us since day one and we just love her thoughtfully made prints, greeting cards, and now globes available in our shop! She welcomes all of you to contact her with custom inquiries at spoonfeatherdesigns@yahoo.com, and you can always shop her goods in our store, or on Etsy too! We are excited to tell you all about Shannon McCarthy the maker behind Detroit based, Comfortably Lovely! At Comfortably Lovely, Shannon currently focuses on making recycled paper goods and accessories. Shannon says she's "a little obsessed with all things vintage" and loves that she can "borrow from nostalgic by-gone times in both feel and material" in her work. She started her handmade career making collages with vintage papers, and in 2004 launched an Etsy shop selling vintage clothing and other items. She realized she needed a name for her business quickly and it came to her in the form of a song. The chorus of "I Love My Shirt" by Donovan came on her turntable where he sings the words 'comfortably lovely' in reference to loving older/well loved items that are still wonderfully usable, and the name stuck. Shannon says, "GOOGLE IT" which we've taken the liberty of doing for you :) Listen to the song here! Currently, Comfortably Lovely is a part-time endeavor for Shannon, she is focusing on online sales as well as selling in more brick and mortar shops (*AHEM shop owners* contact her)! Her favorite part of the creative process is searching for and finding old books and maps to use in her products and we absolutely LOVE the outcome. Comfortably Lovely has been part of the Half Mile Handmade family since DAY ONE and everyone adores her local themed pins and magnets. Shop Comfortably Lovely goods by stopping in to our store or clicking the link below! Today we have the pleasure of introducing you to Krista Pischner the owner and artist of Grand Rapids based KP Studio! KP Studio focuses on fruit, veggie, and herb illustrations and home goods. A couple of unique life experiences led Krista to begin KP Studio the first of which are some cherished childhood memories. She recalls, "I grew up in a little northern Michigan town, Charlevoix, where I spent my summers growing and watering veggies in our family garden. During those summers my mom taught me how to cook." The second was in her senior year of college when she started focusing on farm to table communities. Krista started altering her diet and recognizing the positive changes in her body and lifestyle and began painting photos and illustrating different fruits and vegetables. After college she planted a garden and started illustrating recipes which she turned into a coloring book (her first product) and has been hooked on the idea of making this a business ever since! Her business, of course, is named after her! She says, "I wanted my business name to reflect my lifestyle and artistic brand," but it's something she said she may change up in the future. Her favorite part in the creative process can go one of two ways, "making a really good dish/recipe and then wanting to draw it! Or vise versa!" Krista earned a bachelors degree in Sociology & Studio Art at Aquinas College and currently lives and works in Grand Rapids, Michigan. When she's not working on things for KP Studio she is a full time Senior Property Manager for Dwelling Place as well as a part-time manager at Dime & Regal (we don't know how you do it all, kudos girl)! You can find KP Studio goods by stopping in to see us, visiting her at Made in Michigan Pop-Up Marketplace on June 24th, or by clicking the link below. We are so glad that she is part of the Half Mile Handmade family! We are thrilled to introduce you to Cherie Davila, the creative behind Outsider Art Jewelry today! Cherie makes unique jewelry with all upcycled pieces from her home in Saginaw, Michigan. When her grandmother passed away some broken but sentimental pieces of jewelry were left behind. From there Cherie taught herself how to incorporate them into new wearable pieces and started a business doing so in 1995. Since then she has sold her jewelry in many boutiques and at art shows. In her craft she uses "old broken or cast off jewelry, hardware pieces, and other found objects" that come together to make a brilliant and unique style of jewelry all her own. Wouldn't you agree? Cherie has shipped her jewelry all over the world including the UK, the Netherlands, Canada, Mexico, China, Australia, France and Croatia. We're sure she'd love to work on any custom pieces you might have in mind, too! From start to finish, Cherie has a hand in every part of her process; from finding materials, creating jewelry, photographing, and eventually shipping pieces, it's all her! That's enough to keep anyone busy! We love looking at each piece that she brings to the shop and imagining what it might have been before Cherie transformed in into the beautiful piece in front of us. You can find her at Keepsake Collection at Horizon Conference Center (April 8th), Art and Garden Festival at Anderson Enrichment Center (June 7th), by stopping in to Half Mile Handmade, or by clicking the link below. February Meet the Maker Featuring Never Felt Better Co.
Today we are introducing you to April Frost, the maker behind Never Felt Better Co! Originally from South Dakota, April is now a proud Michigander who has been living in Grand Rapids for the past three years. She has an undergraduate degree in Psych and a graduate degree in Political Science, both from the University of South Dakota. Initially, April began her handmade biz after making some felt flowers for her daughter first birthday. She enjoyed it so much that she found herself making wreaths and other home decor that included these felt flower accents soon after. Then, one day while looking for inspiration she stumbled upon some modern macrame pieces and has put most of her focus into making these types of pieces as well as doing some beautiful hand dyed tapestries. While she does still do some felt flower items she says she "loves the rhythm of macrame and gets lost in the cadence." April says the name of her business came to her one night while she was laying in bed. Originally, the word "felt" had a dual meaning based on her work with felt flowers. Although over time her craft and business has changed, the name has stuck, "Never Felt Better fits me perfectly, and I can't part with it," she says. Her favorite part in the process is the actual physical making of each piece, April says it's easy to get lost in the rhythm (which we find totally believable)! Never Felt Better Co is April's "part-time" gig as she is a full-time mommy when she's not creating. She has been selling her hand crafted felt flower pieces in our shop since day one, and we feel lucky to call her a part of our family! Her favorite pieces to work on currently are the dip dyed tapestries. She says, "they are big, bold, and beautiful and each takes a good chunk of time and focus, but also makes them the most rewarding." You can find Never Felt Better Co pieces by clicking the button below or stopping into Half Mile Handmade.